Embossed metallic suede leather? Come on. *Wait. They're not really made out of ponies, are they?? Forget I said anything. it does say 100% pony... but oh man, are they awesome. maybe they meant to say 100% fake pony, but forgot the "fake" part? yes, that makes me feel better already. I should clarify it's cow or calf hide that hasn't had the hair removed. Hmm, my perfect flats would be manmade :/ boo, so close! 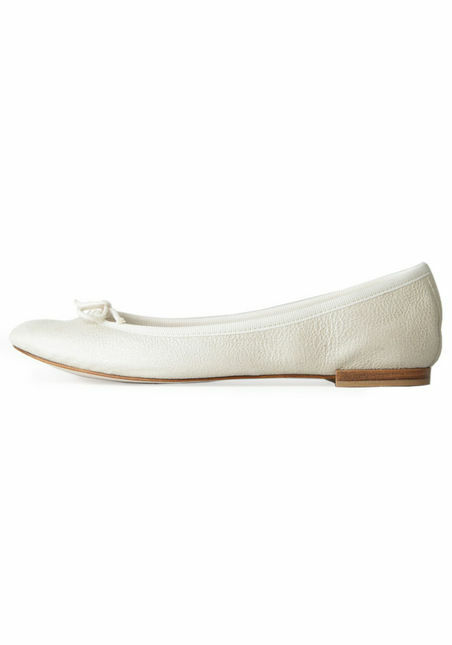 i love those white flats! so cute. it seems like you happen upon perfect flats when it's not time to look for them....but when you need 'em, it's all weird shaped or colored flats everywhere. yikes. Lizzie, exactly. Just bought a pair of flats after an eternal search now these are staring at me. Viva Repetto! Forget wedding, I need these in general. here, here jessica. i do too. OMgoodness!!!! So cute..... my boyfriend is only a teensy bit taller me, so I will definitely be going the ballet flats route!